I’m interested in knowing more about how they classify “poverty”. It seems like a relative term. 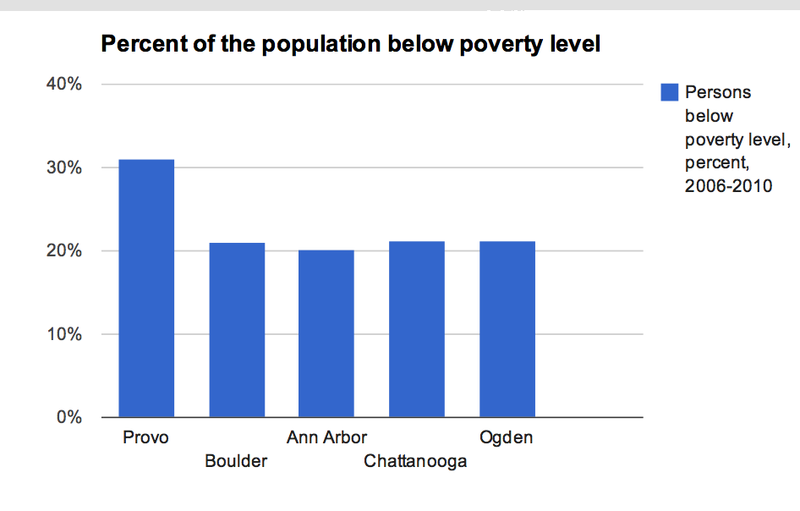 I live in what is probably one of the “poorer” income areas of Provo, but I’ll bet if you ask, a lot of the residents don’t see themselves as impoverished. True well-being is more than an arbitrary income level. 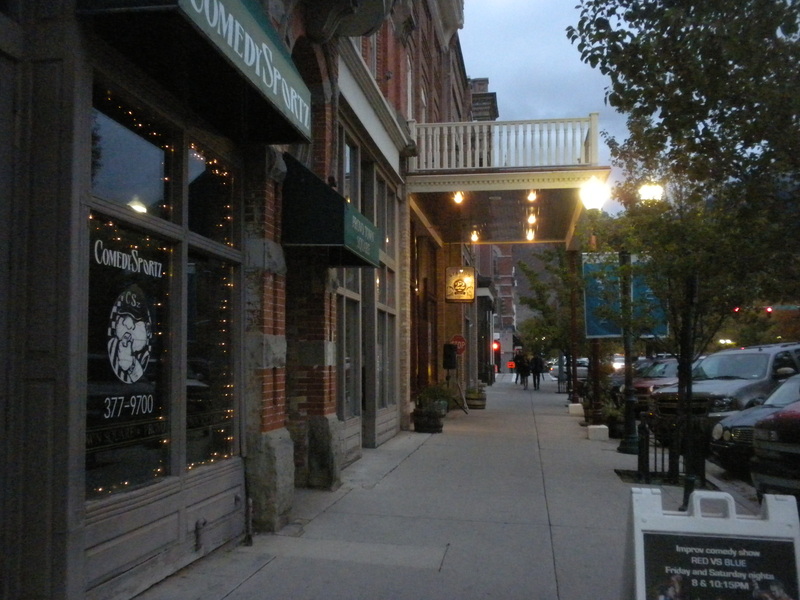 I’ve been to some rust-belt cities, and it’s not hard to see that the residents of Provo are much better off, even if they make a few dollars less. Your point is made though in that less discretionary income around downtown will not fill vacant store fronts, when the higher incomes in Provo have easier shopping access to Orem. I certainly feel for individuals who struggle, want to and do help when and where possible. But it borders on the sanctimonious to say that we should somehow feel embarrassed. Is this a competition? Does it mean that Beverly Hills has already won some significant contest? Should Provo wave its arms over its head, wail and gnash its teeth? I missed the point somewhere. Perhaps the point was just to say something. Perhaps it should also be said that there is a disturbingly large number of people who are blond and blue-eyed in Provo and that we should hang our heads in shame before cities like El Paso or Los Angeles. If poverty was like eye color — so innate and fairly fixed — I’d agree with you. But the reality is that poverty levels absolutely can be changed and there’s a mountain of information (that also spans the political spectrum) out there on how to do it. And it is sort of a competition; any city is fundamentally competing with other cities for resources (most notably labor, but also enterprise, entrepreneurialism, creativity, etc.). My post today on enticing young people makes the point that cities are indeed competing with one another for the people who will drive the housing market for the next two generations. However, perhaps I failed to articulate my point very well. Provo isn’t really in a competition with Beverly Hills, LA or El Paso, which is why I’ve never used them before. I’ve chosen a few cities — ones that residents and officials frequently compare Provo to — as my case studies. I think it’s worth studying how other, comparable cities have developed lower poverty levels in order to do the same in Provo. The US government’s definition of poverty leaves much to be desired. Plenty of ‘poor’ people have nicer TVs and even nicer cars than do many people who are not considered to be living below the poverty line. If ‘poverty’ rates in Provo were a big deal, the Provo-Orem area would not continue to be rated in the top five for great places to live and for having great business environment. Again, I disagree. Just b/c someone has a TV doesn’t mean they have the potential for upward mobility, decent health care, a college education. It’s a red herring to look at a poor person’s one nice thing and say they aren’t poor. Could you effectively raise a family of 4 on less than $25,000? Metrics on business environment and poverty are looking at two completely different sets of variables. Perhaps there is an argument that its not a big deal, but high business rankings don’t prove it. There is another way of looking at this. You could say that Provo is more accepting of lower income earners. There are a lot of factors that could go into that. For example immigration enforcement, a build of ethnically diverse populations, cost of living, or community support for poorer populations. If these are the factors then Provo should actually feel proud to host a more economically diverse population. I think that’s a great way to look it. A large part of it is the lack of preparing our women for the work force and leadership. Creeped out that I wrote our.